Exploring the future of interaction design as the lines between interface and development get blurred. Web developers and graphic designers have traditionally worked in very different worlds, speaking different languages. This may not always be so as apps, websites, and other interaction design outputs continue to blur the lines of where design stops and deep web development starts. But in the meantime, individuals who have worked in both worlds are helpful translators that begin to bridge those gaps. Ron Hall is one of those translators, and last week he was in our studios and classrooms working with students to help them to understand the gap and to help them close it. Ron is a lead developer of Typo3, an enterprise-level content management system built to manage and serve web applications and sites that can total tens of thousands of pages. His Dallas-based company, Busy Noggin Digital, is comprised of designers and developers whose expertise spans interface design, user experience, front-end web development, and back-end web development. This means that Ron manages web development projects that strive to meet clients’ goals at a variety of levels from look and feel to complex e-commerce. 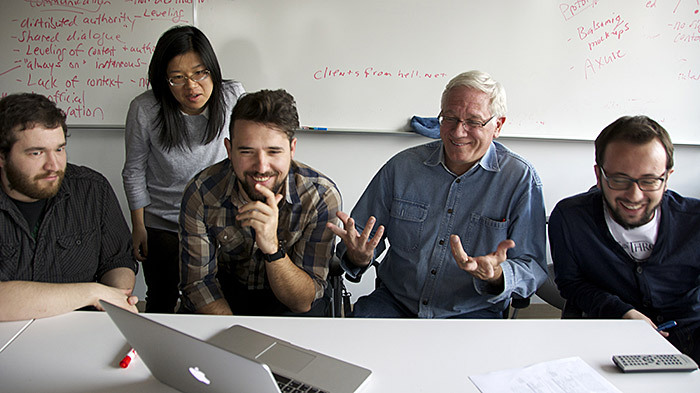 In the xdMFA Core Design Studio, Ron participated in critiques with students as they developed smartphone apps. He pulled from his experience in developing apps from start to finish to offer insights into students’ design decisions. Across the span of the entire week, Ron discussed the changing shape of interaction design with students—with conversations often covering where web design has been and where it is going. These conversations touched on how coding, interface design, electronics, and other practices continue to shape society through products and services that apply them. 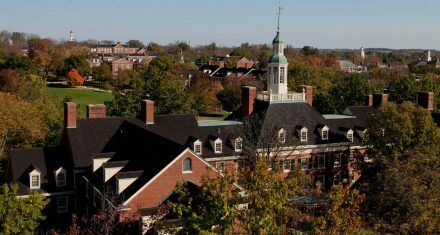 On Tuesday, November 11, Ron presented Starting, Growing, and Managing a Web Design and Development Business to students and faculty at Miami University. In his presentation, Ron shared his own career experiences in business as an entrepreneur and owner. He addressed how to start out as a web designer and what skills students could develop outside of design to extend their knowledge and to broaden their career possibilities. In the presentation, students learned that the most influential factor in Ron’s successful business has not been technical skill or code knowledge, rather it was the ability to develop trust with clients. Coupled with web application-level development and advanced content management system know-how, the ability to engender trust with clients as partners in development has helped Busy Noggin Digital to grow into a respected and thriving business in just a few years. Ron’s presentation touched on what students needed to learn as they further their careers, but also what they needed to be in order to foster business connections over the long-term. Ron’s visit included lunches, studio visits, and one-on-ones where students could get their questions answered about what it’s like to design and develop effective web applications. In just the few days following it has allowed students and faculty to begin to apply what they have learned into their design work and curriculum in order to be consistent with current interaction design best practices. That’s what happens when a translator comes to visit: greater understanding is gained and new connections are made. 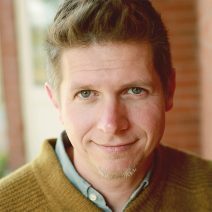 Dennis Cheatham researches people + design at systemic and experiential levels. His work focuses on end-of-life and aging topics.